It’s huge and they say walking down the main street (Grant Avenue) is as close as you’ll get to china without actually being there. There are restaurants and shops selling all kinds of Chinese produce, much of it out on the sidewalk. Grant Avenue can be so crowded it’s difficult to walk on at times, but the surrounding streets tend to be quieter and many are decorated with Chinese lanterns. The Chinatown Gate you may be familiar with is at the City Centre end of Grant Avenue. This is an extract from our free San Francisco City Guide. San Francisco’s Chinatown started to be established in the 1840s and it has two major thoroughfares from the City Centre, Grant Avenue and Stockton Street. All the streets that link them are similarly decorated. A major focal point in Chinatown is Portsmouth Square which often bustles and is one of the few open spaces in the area. You’ll find Tai Chi sessions here and chess players too. 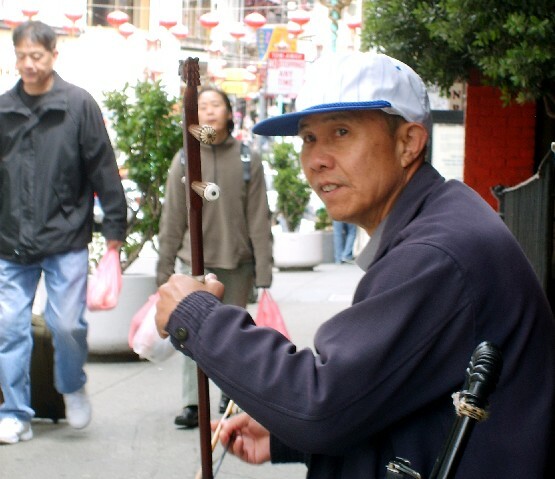 You can see the best bits of Chinatown on the San Francisco Chinatown Walking Tour which is getting some good reviews from tourists who’ve been on it.